Not to get too Jewish here, but this is the time of year when my people celebrate, pray, repent, and reflect. It's a time to spend with loved ones, with friends, and with community. It's a time to do good deeds and give to charity. This week and a half even has a fancy title. It's called... The Days of Awe. How fitting it is that today fell during these special days. Because there's only one way to describe how I feel about the events of the day. In complete awe. I'm in awe of the 8500 people who walked along the Boston Marathon Course to raise money for the Dana Farber Cancer Institute. 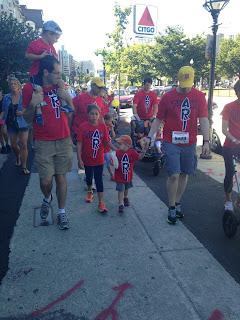 I'm in awe of the 66+ friends and family members who walked as Team Ari today. I'm in awe of both of my kids who stayed alert and awake and happy for the entire walk. I'm in awe of my brother and sister-in-law who surprised us with a weekend visit. I'm in awe of the anonymous donor who matched all Team Ari donations. I am in serious ohmygod awe of the $173,000+ that Team Ari has raised as of today. And I am in awe that these funds are paying for a year-long research project on a new drug for pediatric Leukemia so that it can proceed to clinical trial. I'm in awe that this drug may save my son's life. 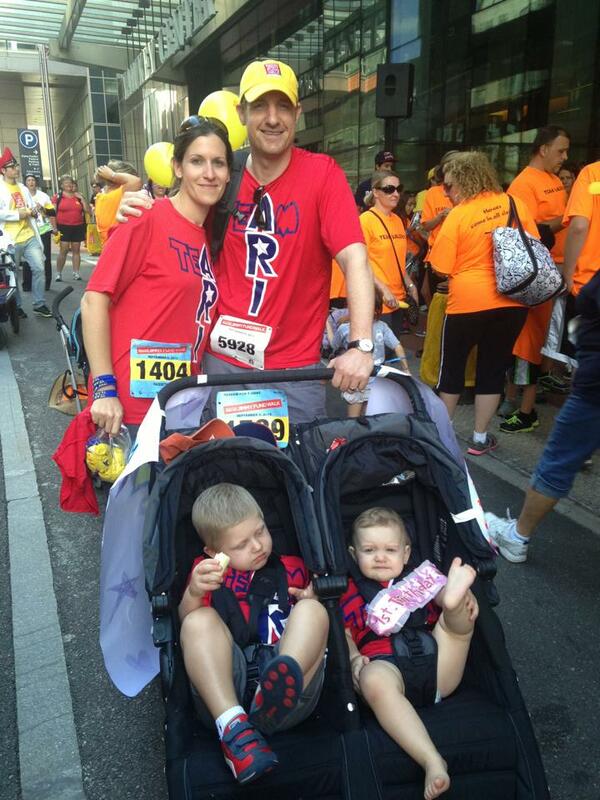 I'm in awe that Team Ari can have a dramatic impact on my family and on children everywhere. I'm in awe that this research is being done by Ari's medical team and in our city. 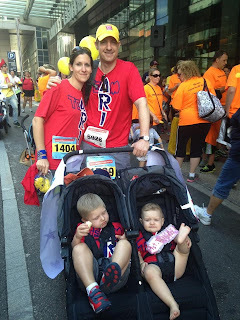 I'm in awe that Ari's doctor cheered alongside us in a matching red team shirt. I'm in awe of all of the doctors and nurses and staff who have become part of my extended family. And I'm in awe that my baby girl turned 1 today. I'm in awe that she remains so happy, easy, and in love with her big brother. I'm in awe that this year, which at times felt so long and scary and sad, culminated in a day filled with happiness and hope and celebration. I am in awe of the outpouring of love that you all show me and my family. And I am in awe of the outpouring of love you have shown me and my family since the day Ari was diagnosed. You have all been on Team Ari since day 1. Today was a special and heartwarming opportunity to stand united with the members of our team and join the larger Dana Farber community to work towards finding a cure. Thank you to the walkers, the donors, and the cheerleaders. I am in awe of each one of you.